Retractable Banners are printed in full color on one side on synthetic 10 mil White Block-out Banner material. They are designed to be displayed with a Retractable Banner display or stand and rolled for storage. One Banner at a time can be stored within the base of a Retractable Banner display. 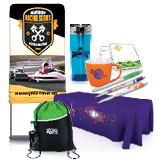 We sell display stands that accommodate retractable banners from 24" x 34" to 33" x 80". If you are ordering a Banner for other retractable display stands, please make sure to order the correct size. A portion of the Banner bottom will remain hidden in the display base; ours hides the bottom 6". Note: Because of the wide potential size range of our large format products, there are additional file setup considerations. Proofs are typically shown half size. For other details, please review the file setup section carefully. The most common order options are 33" x 78" and printed on 10 mil White Block-out Banner. Almost always, retractable banners print in full color on the front with no printing on the back (4/0). Retractable Banners are used anywhere you would like to display large format freestanding graphics. They are most often used where portability is a key consideration, such as at trade shows, seminars, and presentations. Retractable Banners are also a good idea if you would like to move them around within your business environment. Consider using them for storefront displays to showcase a new product or special. Our Banners exhibit a wide color gamut, so they are great for colorful graphics. Banner displays or stands are designed so that the Banner can be changed. This product is for people who already have one or more stands and would like replacement Banners because it does not include a display stand. Available in custom sizes ranging from 12" x 12" up to 84" high x 52" wide.